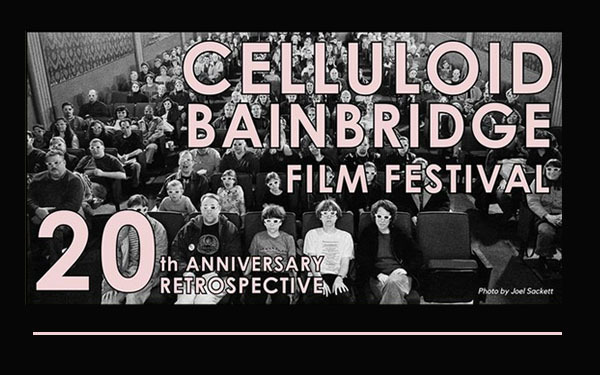 In anticipation of Celluloid Bainbridge’s upcoming 20th anniversary retrospective (November 17-18), festival founder Kathleen Thorne and Lynwood Theatre maven TJ Faddis talk with BCB host John Fossett about the history, technical challenges, and highlights of this iconic film festival. Over the last 20 years of the festival there have been numerous surprises. Listen here and learn about the Trojan Horse, the true test of a Bainbridge Islander, the superstition surrounding one film, which filmmaker has TWO films in the festival (one under an assumed name), Kathleen’s own surprising contribution to the festival, and what’s a cowboy hat got to do with anything? For this year’s festival, the Opening Night Reception will take place at 5pm on Saturday November 17 at the Marketplace at Pleasant Beach. Guests will enjoy fine food and drink and the company of Bainbridge Island author Jonathan Evison. After the Reception, head across the street to the Historic Lynwood Theatre for an exclusive screening of “The Fundamentals of Caring,” the 2016 film based on Evison’s best-selling book “The Revised Fundamentals of Caregiving.” Evison will host a Q&A after the film. And then, free all day Sunday at the Lynwood Theatre, you’ll see feature-length dramas, documentaries, comedy shorts, and experimental music videos, all representing the creativity, the hilarity, and the heart that have defined Celluloid from the very beginning. 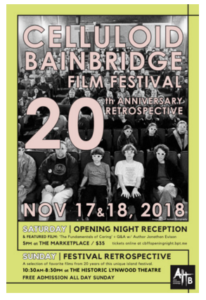 Don’t miss this fabulous 20th anniversary retrospective: it’s quintessential Bainbridge! For more information and a list of participants visit CelluloidBainbridge.com.